We like comics. We like memoirs. We like comic memoirs. 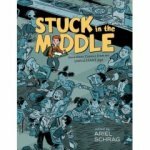 And we especially like comic memoirs told in comics. 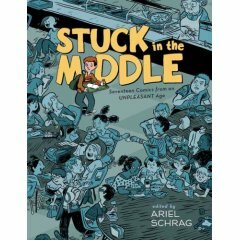 On Friday night, a variety of fine folks who share these enthusiasms packed Brooklyn’s Rocketship for booze, meat on sticks, and readings from Stuck in the Middle: 17 Comics from an Unpleasant Age. Is there any personal storytelling more visceral than honest dispatches from junior high? This charming anthology covers summer camp, first periods, boyfriend-stealing, name-calling, and Doogie Howser, MD. Before the party, I had the good fortune to share fluorescent cocktails with cartoonists Vanessa Davis, Trevor Alixopulos, and Aaron Renier, PW “The Beat” Comics blogger Heidi MacDonald, Heeb Magazine publisher Josh Neuman, and comics proselytizer (and SMITH and Heeb comics editor) Jeff Newelt. 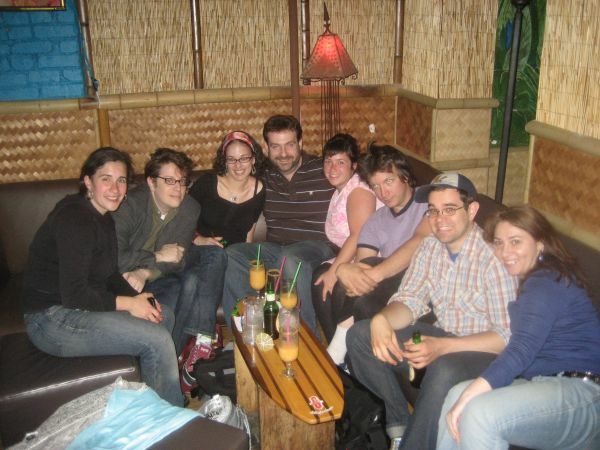 It was an insanely smart and talented crowd, even if conversation veered towards 90210, braces, and Judy Blume novels. Turns out our eighth-grade traumas are pretty funny now, so don’t forget to tell your stories—or draw them. This story about Flickr’s bumpy road to implementing some safety standards is zooming up Digg and around the blogosphere. Click slowly and see. It took me, I kid you not, hours to find today’s video — everything I tried just didn’t cut it. I even found a funny Super Mario parody, but the ending sucked, and I just couldn’t do that to you all. But it was worth it, because finally what I found is a great instructional video. This is no DIY big food, people. This is something we all can use. What comes between six and 100? 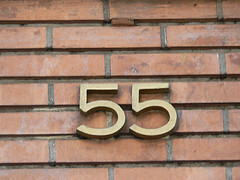 Fifty-five (more or less). The editor of Bird and Moon, a creative enterprise that includes comics, art, birds, and 55-word stories, tells us: “55 Words seeks stories that are 55 words long. Stories must have all that story goodness: character, setting, and a beginning, middle, and end.” To submit, click here. • Jon Friedman and his brilliant The Rejection Show is accepting submissions for his new book, Rejected. Details here. • Robert Wilder, author of Daddy Needs a Drink, is having a Daddy Needs Your Stories Father’s Day Contest. Three winners will receive signed copies of Daddy Needs A Drink just in time for Father’s Day. Sure, not exactly an iPod, but writing about your own pop, or being one, is usually a good idea. (Just ask Neal Pollack.) If you don’t win, send your entry to us and we’ll post our favorites. Details here. We’re thrilled to be one of the first subjects of Pulp Secret, a new online network devoted to comics. Pulp Secret’s Ana Hurka-Robles came to a recent SMITH editor brunch (bonus points if you can find the lovely and talented Riza Cruz looking for lox in the background) and did extensive interviews with myself, A.D.: New Orleans After the Deluge creator Josh Neufeld, and A.D. character Dr. Brobson Lutz, who happened to be in town (and loves lox). Hurka-Robles spent a lot of time with us, as well as the comic, and does a masterful job of telling the story of the making of A.D. To view this short video, press the small play button below, or click the image to view on Pulp Secret’s site (where you’ll need the latest version of Flash for the click through to work). The current issue of The New York’s all about “Innovators,” and starts with three separate Bruce McCall-created covers called “The Ascent of Man.” I’ve read one piece so far, a mercifully short (for him) and totally engaging piece Ken Auletta profile on Walter Mossberg, the powerful Wall Street Journal Personal Tech columnist and something of a conference mogul. The best idea of the piece comes at the end. For years, a Mossberg pick or pan could make or break a product (and still can). But in the age of Gizmodo, Endgadget and a thousand blogs-a-blooming, how important is one trusted authority on consumer technology—or anything else. From The Wall Street Journal, how to be a YouTube star. From The New York Times Magazine, featuring a cameo by my favorite coffee spot, Gorilla, how to use the net to make friends and influence musicians. Which is a long way of saying: head to The War Room at Mo Pitkins in NYC’s Lower East Side, get mad, get going, and drink up. By our estimate, there are approximately three million mom blogs in the world—but we cop to playing favorites. Even those of us at SMITH who aren’t moms, or even parents, can’t get enough of the honest, intense, funny, and explosive Girl’s Gone Child, from writer, blogger, confessor, and mother Rebecca Woolf. We asked Rebecca for her favorite mom blogs, and she responded by offering SMITH readers not just her favorite mom blogs, but her favorite actual posts. They are lovely. 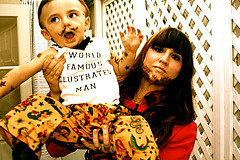 For anyone who has ever doubted the literary talent of the mommy blogger, perhaps you need to take a closer look. The following excerpts are some of my favorite recent (and not so recent posts) written by amazingly talented and perceptive mothers and women, expressing their deepest fears and truths and favorite moments. Enjoy. On the stories that carry us through, from Mama Scribes. On turning one, a letter from mother to daughter, from Mom-101. On home, from Sweet Juniper. On taking shots of her beautiful, growing belly, from Ittybits & Pieces. On love, from Her Bad Mother.